Event is Full. Registration now Closed. ​In this class we will explore how to increase our ability to be compassionate with ourselves, our loved ones, and people we find challenging to interact with. We will also explore how we can meet the suffering in our world and actively respond to it from a compassionate stance. We will explore how to bring compassion into our social justice activism. We will apply the teachings and practices of Buddhism and Nonviolent Communication (NVC) in this class. Research at Stanford medical school is showing that compassion results in a deep sense of well-being, it promotes the immune system, and also results in decreased levels of stress. According to Dr. Doty, founder of Stanford’s Center for Compassion and Altruism Research and Education, “Compassion is what is going to save our species”. Buddhism considers compassion one of the two wings of the great bird of awakening along with wisdom. According to the Dalai Lama – “If you want others to be happy, practice compassion. If you want to be happy, practice compassion.” Modern research and Buddhism are unified in the belief that we can increase our ability to be compassionate. Note: No prior knowledge or experience with Buddhism or NVC is required to participate. All are welcome. Lunch included. Venerable Tenzin is authorized by the FPMT to teach at both the foundational and in-depth levels, and is also a teacher of Cultivating Emotional Balance (a secular program developed by Alan Wallace and Paul Ekman). 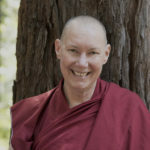 She is at the final stage of teacher training for Compassion Cultivation Training, a program developed by Geshe Thubten Jinpa and colleagues at Stanford University. Venerable Tenzin joined the faculty at Land of Medicine Buddha in August 2018.